30 May nationwide bank strike will go on till 31 May. ATM's will also be going to close. There are many problems you will have to face. Here is some idea by which you could manage this problem. 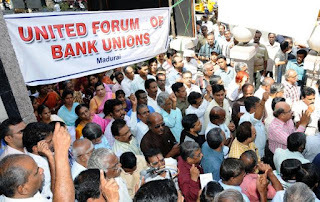 Around one million bank employees will go on strike from tomorrow. The two-day nationwide strike will end on Friday, 1 June at 6 AM. Those who bank with ICICI Bank, HDFC Bank, Axis Bank, YES Bank and IndusInd Bank will not be impacted by the strike. These five banks have no trade unions and hence won't participate in the two-day strike called by around nine bank unions. Foreign bank employees will also participate in the nation-wide strike as they are members of these unions, but not their bank officers said Venkatachalam. State Bank of India (SBI) said the Indian Banks Association (IBA) has communicated to the bank that the United Forum of Bank Unions (UFBA) has served a notice to go on a nationwide bank strick. The call for a nation-wide strike follows the IBA's delay in resolving a charter of demands, the government's casual approach to wage revisions for bank employees and a meager offer of a two percent hike in wage revision. UFBU has demanded an expeditious and early wage revision settlement, adequate increase in salary and improvement in other service conditions and wage revision settlement to include all officers up to scale VII. So far, 10 wage revision settlements have taken place at first in five-year intervals and then four-year intervals beginning 1966. These are some reasons due to which banks are going to nationwide bank strike and by using the above-mentioned idea you can manage.